Sukanya Samriddhi Scheme Yojana is popular saving scheme for the girl child. This scheme is launched by the government under “Beti Bachao Beti Padhao” campaign in 2014. It is one of the highest interest paying scheme. It is estimated that around 20-25 Lac accounts are already opened under this scheme. Nevertheless, since the beginning, there were some confusions related to Sukanya Scheme, like opening SSA account by NRI, electronic mode of money transfer etc. In order to overcome these confusions and to make this scheme lucrative, the government has notified new rule for Sukanya Samriddhi Scheme. 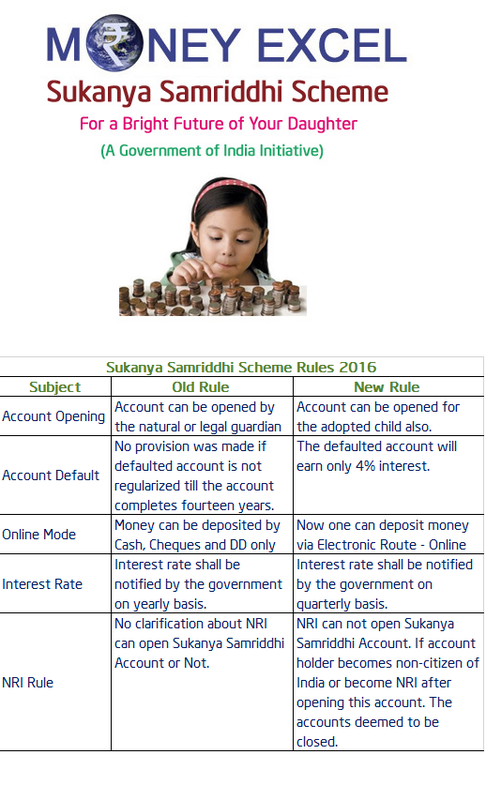 These new rules are called as Sukanya Samriddhi Scheme Rules 2016. These rules are effective from March, 2016. Let’s try to demystify new rules of Sukanya Samriddhi Scheme. Old Rule – The account may be opened by the natural or legal guardian in the name of a girl child from the birth of the girl child till she attains the age of ten years. No provision of opening of the account in case of adopted child. 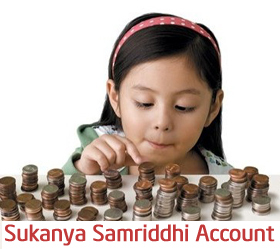 New Rule – As per new rule Sukanya Samriddhi Account can be opened for the adopted child also. Old Rule – As per earlier rule, deposit in sukanya samriddhi account was allowed till completion of fourteen years from the date of opening of the account. New Rule – As per new rule deposit can be made in an Account till the completion of fifteen years from the date of opening of such Account. Minimum of one thousand rupees should be deposited in this account every financial year. If money is not deposited it can be regularized with a penalty of Rs.50 per year. If the account is not regularized or money is not deposited account will be called as defaulted account. No provision was made if defaulted account is not regularized till the account completes fourteen years. New rule specifies that if defaulted account is not regularized within fifteen years of the opening of the Account, then the whole deposit, including the deposits made prior to the date of default, shall be eligible only for interest rate prescribed for Post Office Savings Bank at the time of its maturity. This means defaulted account will earn only 4% interest. The above rule is not applicable if the default occurred because of the death of the guardian of the Account holder. Maximum deposit allowed under SSA scheme is 1.5 lac for a financial year. Maximum deposit limit is kept as it is i.e 1.5 lac. However, provision is made that by any mistake excess of money (more than 1.5 lac) is deposited in the account it can be withdrawn anytime by the depositor. Old Rule – Interest rate shall be notified by the government on a yearly basis. New Rule – The Interest rate on saving scheme like Sukanya Samriddhi shall be notified by the government on a quarterly basis. The interest shall be calculated for the calendar month on the lowest balance in an Account on the deposits made between the close of the tenth day and the end of the month. The account can be closed immediately in the event of the death of the account holder. It is mandatory to produce death certificate by the competent authority. Entire balance amount along with interest shall be payable to the guardian of the account holder. If a deposit of yearly amount in this account is causing hardship to the depositor pre-mature closure is allowed. The first rule of premature closure of account remains as it is. However, following additions are made. If account holder becomes non-citizen of India or become NRI after opening this account. The accounts deemed to be closed. No interest shall be payable from a change of such status. In case any interest was credited to the account after change of status (NRI or citizenship change) same shall be reverted back to the government account. Rules for the premature closure in case of undue hardship remains in force. The account may be transferred anywhere in India if the girl child in whose name the account stands shifts to a place other than the city or locality where the account stands. The account may be transferred anywhere in India and from the post office to bank or bank to post office. One need to submit proof of address change to initiate this transfer free of cost. However, if you want to transfer without submitting address change proof you can do so by making payment of 100 Rs. Old Rule – To meet the financial requirements of the account holder for the purpose of higher education and marriage, withdrawal up to 50% of the balance at the credit, at the end of preceding financial year shall be allowed. New Rule – The 50% limit for the withdrawal is kept as it is, however following additions are made. Such withdrawals are not allowed until account holder attains the age of 18 years or has passed 10th Standard, whichever is earlier. All withdrawal application should be attached with documentary proof. E.g Confirmed offer of admission of the Account holder in an educational institution or a fee receipt from such institution clarifying such financial requirement. This amount can be withdrawn lump sum at single go or in an installment, not exceeding one per year, for a maximum of five years. Hope you find this post useful. Do share your thoughts on the Sukanya Samriddhi Scheme Rules 2016. I have opened SSA Account last year in post office. Can I transfer the same A/c to any bank? If yes .. How? Very informative..If we are out of the country then can’t someone else deposit the money on our behalf to continue the account till we are back to india?if one becomes NRI then should we stop depositing the amount?? It was noted NRIs cannot open Sukanya account. I, being an NRI, already opened account last year through SBI and amount is lying there. What I should do? cancel this account? they will pay the int? As per new rule you need to inform to SBI and this account should be closed as no Interest shall be payable as per new notification.